BANGI, 10 June 2014 – Moves towards having an exemplary family is dependent upon the understanding of the philosophy and concept of marriage which has to be based on good intentions, faith and piety. 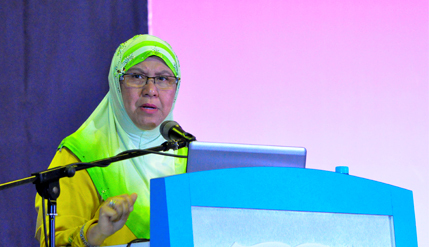 Deputy Vice Chancellor (Students and Alumni Affairs) Prof Datin Noor Aziah Mohd Awal said this in her talk “Creating Exemplary Family Units through the Enactment of Islamic Family Law” at the Bicara Sakinah Programme of the National Dakwah Foundation in conjunction with the National Dakwah Programme 2014. The programme was launched by Minister of Women, Family and Community Development, Dato’ Sri Rohani Abdul Karim at The National University of Malaysia (UKM) here recently. Prof Noor Aziah said the way to achieve an examplary family is to start on the right footing as the family members will face various challenges that can affect family bonding as the years go by. Having a family should not be a burden but is nonetheless not easy as there will be many challenges and obstacles faced by a couple. But in the end a family is where there is love and acceptance among all its members. That is why there is a need for a marriage to begin on the right footing, she said. She lamented the preponderance of modern day love between the youth nowadays where romance, loving and caring is obvious before marriage but change for the worse soon after the wedding. “Before marriage, a couple will text, call and email non-stop. If they go one day without seeing or hearing from each other, they get all moody and sad. The men before marriage will send gifts, buys flowers and go shopping with the girls and pay for the shopping but after a few years of marriage they behaved as if they can no longer stand each other. What has happened to all the love then?” said Prof Noor Aziah. Thus statistics compiled by the Religious Department found on average three Muslims couples in the country are getting divorced per hour in 2011. Thus on average 70 divorce cases are reported a day making up to 25,000 Muslim divorces in the country in 2011. Prof Noor Aziah said the situation is becoming worse and all because many married couples even in the first three years of marriage found they do not have much in common or had misunderstood one another. She referred to the Quran which provides that having a family is to find peace and solace in one’s life and to be balanced and well-rounded emotionally and mentally. The people, she said, needed to equip themselves with better and deeper knowledge of the religion and how to manage a household before they decide to plunge into marriage. That would certainly reduce the number of divorce cases and would actually bring about happier families. People should know what they are getting into when deciding to get married. It is not a game but it need to be taken seriously. A marriage is not just a union of two people but is also the bonding of two families. Thus in divorce cases it is not only the husband and wife that is being separated but can result in the separation of two families, Prof Noor Aziah said.